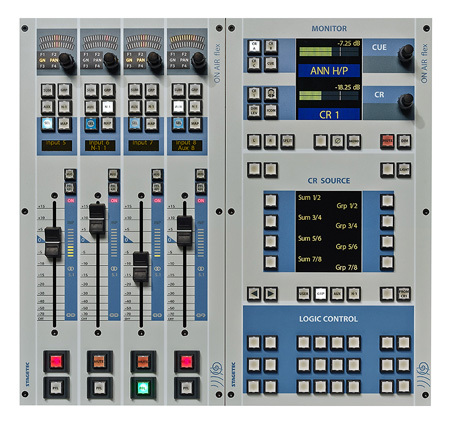 A modular digital audio mixer for all broadcast applications using IP connectivity throughout. Control surfaces may be either hardware or virtual, using an internal web server, allowing unprecedented freedom of configuration and operation. On Air flex uses the highly developed Stagetec NEXUS audio router as its core matrix, allowing configurations with up to 54 input channels and 32 mix buses. I/O can be any combination of formats, being determined by the NEXUS modular system. See also the entry for the Nexus router for information regarding the central DSP core and I/O hardware aspects of the On Air flex. The Stagetec On Air flex is a development of the established On Air 24 modular digital audio mixer, and uses the same hardware control surface elements. The NEXUS audio matrix provides the audio I/O and processing. However, all inter-element connections between parts of an On Air flex system are via IP over a standard Ethernet infrastructure, and the system includes a web server. This opens up the possibility of full audio mixer configuration and operation from virtual user interfaces on compatible devices (Windows/OS X, Android, iOS or Windows Phone) in addition to as an alternative to conventional hardware controls. The On Air flex uses an XCMC card within the NEXUS matrix to provide the mixer’s DSP. Mix architecture is user-definable, and a typical configuration the card can support is one of 32 inputs with 8 groups, 8 summing buses, 8 aux sends and 8 mix-minus buses. I/O in NEXUS is fully modular, with input and output modules available in a variety of analogue and digital formats, the latter including AES/EBU and MADI. The modularity of NEXUS means the system is fully scalable; additional I/O and further control surfaces can be added as required. Two hardware control panels are available. The OFAD panel has four channel strips: each strip is fitted with a Penny & Giles 100 mm motorised fader, mute and PFL/AFL buttons, a dual concentric rotary encoder, ten further momentary action, illuminated switches, plus OLED displays for channel ident and two bargraph indicators which can configured to display input gain setting or other parameters. A channel level bargraph meter is located immediately next to the fader: this can monitor either the PFL or the AFL signal. Any number of OFAD panels may be used in each location, either co-located or mounted separately, as each location requires. The OMON Monitor panel provides functionality for two monitor outputs – Cue and Control Room – with rotary level controls and OLED metering, etc. Monitoring may be either stereo or 5.1. The OMON panel has a second OLED display to indicate the sources currently assigned to eight monitor source selection buttons; multiple pages may be set up, so the number of possible sources is not limited to eight. There are also 24 user-definable buttons which interact with NEXUS logic functions, and are again, fully user-definable. As an alternative to hardware panels, On Air flex’s web server permits a web browser on any compatible device to act as a control device. No app is required. A set of simple and elegant control pages allows full control of the mixer system (sample page pictured). The pages may be modified by the user if wished; fully customised panel layouts may also be designed. A simple programming language, MapCfg, has been developed to allow any panel layout, with any set of functions to be easily realised. A library of graphic control elements (‘widgets’) is supplied to assist in virtual panel design. The open architecture of On Air flex allows individual users to optimise their interface to suit their requirements precisely, while the network concept permits several users to access all audio resources simultaneously, thereby maximising workflow. The wide range of user-definable logic functions allows the audio mixing system to be integrated into the existing broadcast infrastructure to whatever degree is required. The On Air Flex benefits from Stagetec’s excellent build quality, and is designed for continuous use in on-air studios. Reliability is enhanced by the provision of dual redundant power supplies and a fail-over facility within the NEXUS rack.